Orlando’s CBS station is known today at WKMG-Local 6. But 40 years ago, it was just WDBO-TV Channel 6. 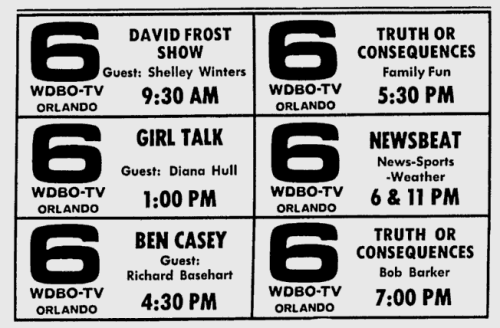 And the station’s newscast was known as “Newsbeat.” Here’s a newspaper advertisement from November 1969 promoting some of the shows on Channel 6 during the day — including a double dose of Truth or Consequences. Prank or Sweeps Story in the Making?